This article argues that there are many questions that lawyers might ask, and conversations that they might have, about smart contracts; that some questions that are asked are more important than others; and that there are some questions that are not asked but which should be asked. First, it is argued that the question that preoccupies ‘coherentists’ (concerning the application of the law of contract to smart contracts, and the fit between smart contracts and the paradigmatic ‘fiat contracts’ that are recognised by the law of contract) is neither as puzzling nor as important as might be supposed. Secondly, it is argued that, if there are concerns about the acceptability of smart contracts, then the conversation that needs to be had is of a ‘regulatory-instrumentalist’ nature; in particular, if the question is one of public policy restrictions on the use of smart contracts, then the appropriate balance of interests needs to be made by an institution that has both the necessary mandate and the appropriate mind-set. Thirdly, it is argued that there are conversations that we currently do not have but which urgently need to be had. Blockchain is a potentially transformative technology and it is important to have more fundamental conversations about the kind of community that we want to be. This article is an expanded and revised version of an opening keynote address given at the conference on ‘The Transformation of Finance and Investment: Information and Technology Revolutions’ that was held at University College London on 22 March 2018. I am grateful to the editors of this special issue for their feedback on my draft. Needless to say, the usual disclaimers apply. Not all aspects of ‘Fintech’—understood in a broad and inclusive way as referring to financial technologies—occasion puzzlement. For example, there is not much mystery about automated teller machines (ATMs). However, some of the more recent developments in Fintech are genuinely puzzling. As Adam Greenfield says, ‘Almost all verbal conversations involving the blockchain begin and end the same way…: in perplexity’.1 Similarly, almost all discussions about smart contract applications generate more questions than answers. Lawyers are not sure about the technology or its utility, and technologists are not sure about the law. Given such puzzlement, it might seem natural to ask whether the current regulatory environment is fit for purpose. However, this is not the first question that many lawyers ask. Rather, as I have already intimated, their opening question, and the source of much of their puzzlement, is about how these new technologies fit with existing doctrinal templates and classifications. In other words, the question is about where we should file these phenomena within existing classificatory schemes, not about whether our classificatory schemes are fit for purpose. In this article, I do not hope to be able to remove all the puzzlement and answer all the questions. However, I hope to clarify which questions we really should be asking and why so. To do this, I will proceed in four stages. First, I will offer an example of a contractual claim (made by a third-party beneficiary) which the courts, historically, would not have enforced and which might have seemed like an eligible case for the use of smart contract technology (had it been available at the time). With this example, we have a context in which we can begin to address the questions that we have about how the law of contract and fiat contracts relate to smart contracts as well as about the likelihood of fiat contracts being replaced by smart contracts. Secondly, I will outline two principal conversations (each with their distinctive agenda of questions) that we might have about smart contracts. One conversation (a ‘coherentist’ conversation) focuses on how smart contracts fit with the law of contract; the other conversation (a ‘regulatory-instrumentalist’ conversation) focuses on whether the law is fit for purpose. Thirdly, I will address the question of whether smart contracts prefigure the end of contracts, contract law, and a ‘transactionalist’4 understanding of the basis for the rights and duties arising from a contract. Finally, I will ask whether we have missed anything that really matters in our questions and conversations; and, in response, I will sketch some fundamental matters that are missing from our conversations. My conclusion is that, in general, we would do better to start with a regulatory-instrumentalist conversation, seeking to establish what the benefits and risks of smart contracts might be and then putting in place a regulatory framework that strikes a reasonable balance between whatever competing interests there might be. However, this is not sufficient. We also need to reinvent our coherentist conversation so that it engages with the deeper questions of the kind of community that we value and really want to be. In what circumstances might it make sense to employ a smart contract? Where the infrastructure for commerce and contracts is altogether lacking, or is compromised, smart contracts might well be a significant option.5 However, where a viable infrastructure for transactions is in place, smart contracts are likely to be used (at least initially) in a more ‘interstitial’ way, filling in where there are gaps in existing support, or responding to new markets that are not satisfactorily served by existing provisions. In this article, I will assume that the context for discussing smart contracts (and their relationship to the law of contract) is one in which there is already an established and viable infrastructure for commerce and transactions (although not necessarily one that fully responds either to the ways in which business is organised6 or to the needs of transactors who are neither business suppliers nor consumers7). Essentially, the form of the dispute in Tweddle v. Atkinson was as follows. It was agreed between A and B that they would each pay a sum of money to C (who was the son of A) on the marriage of C to D (D being the daughter of B). C duly married D. However, B died before his portion of the agreed sum had been paid to C. Although A and B had expressly agreed that C should be entitled to enforce the contract, the court declined to enforce the agreement at the suit of C. Whatever the precise doctrinal reason for treating C as ineligible to enforce the contract between A and B, the fact of the matter was that the court would not assist C. Given this restriction in the law, had smart contract technologies been available at the time, we might think that this was just the kind of case in which their use might have appealed to A and B. For the smart contract would simply need to be coded for payment of the agreed sum in the event of the marriage taking place: that is to say, the technology would ensure that, once the marriage of C and D had taken place, then the agreed sums would be paid to C.
Fast forwarding to 2019, English law is no longer so restrictive, one of the principal purposes of the Contracts (Rights Against Third Parties) Act, 1999, being to give third-party beneficiaries, such as C, a right to enforce in precisely such a case as Tweddle v. Atkinson (where this was clearly the intention of A and B).9 Accordingly, in a similar post-Act scenario, the calculation for A and B would be different. The risk would be not so much that C might be left without a legal remedy but that the practical cost of obtaining a remedy might be an issue for C. Hence, for A and B, the question would be whether, all things considered, their preferred option is to commit the contract to the blockchain. On the basis of this example, we can make two points that seem relevant to easing some of the perplexity that surrounds smart contracts. The first point (in Sect. 2.1) relates to the question of whether smart contracts fit the template for fiat contracts and, concomitantly, how the law of contract might be applied where smart contracts are used; and, the second point (in Sect. 2.2) relates to the question of whether smart contracts might come to dominate the transactional landscape. Accordingly, if we focus narrowly on the coded instructions that express the smart contract, we might well wonder whether what we are looking at does meet the criteria for a fiat contract. There are several points to make in relation to this question about the characterisation of smart contracts. First, let us suppose that we translate the computer coding into a natural language. If, once the coded instructions are translated back into a natural language, they do not reveal a ‘deal’ (an exchange of values), then this particular smart contract will still not look like a fiat contract—but, of course, this follows from the fact that there is no deal, not from the fact that this is a smart contract. By contrast, if the translated smart contract does disclose a deal, then (other things being equal14) this has the makings of a fiat contract. So, we should not jump to the conclusion that smart contracts can never be treated as standard fiat contracts simply because some examples of smart contracts do not have the basic elements for a standard fiat contract. Secondly, anticipating a matter to which we will return in Sect. 3 of the article, where a smart contract is being used as a tool to give effect to a standard fiat contract, the law of contract will engage with the latter and only indirectly with the former. To explain, in our example (based on Tweddle v. Atkinson), suppose that C and D marry but the Oracle (the off-chain trusted third-party information provider) does not transmit that the relevant event has taken place. As a result, the transfer to C is not triggered. Setting aside the possibility that C might have a legal claim against the Oracle, C’s obvious remedy is to sue A and B for breach of their (standard fiat) contract. To be sure, C’s complaint is that the smart contract has not worked as intended; but, if we set aside the possible liability of others, C is arguing that the responsibility for this failure lies with A and B. At no point does C’s claim against A and B—a claim for breach of contract against A and B—seem to hinge on whether the smart contract itself fits the standard specification for a fiat contract. Will smart contracts, as it were, sweep the transactional board? Do they, in effect, spell the end of fiat contracts and contract law? The latter is a question to which we will return in Sect. 4. However, in our particular example, there are at least three reasons for thinking that A and B might not have chosen to use a smart contract. First, the context in which A and B agreed to pay sums to C was one of a potentially closer relationship between the two families. Even if the families had not previously ‘got on’—indeed, even if A and B did not trust one another—this might have been exactly the wrong time to suggest the use of smart contracts and signal this lack of trust. Secondly, unless the smart contracts were so smart as to use fiat currency, the inconvenience of obtaining, or subscribing to, the particular cryptocurrency might deter A and B from making use of the technological option. Moreover, even if this inconvenience did not deter A and B, the cryptocurrency might not be welcomed by C which, in turn, might steer A and B away from this option. Thirdly, if there are concerns about ‘bugs’ in smart contract coding or if there is any doubt about the reliability of Oracles and off-chain sources, A and B might prefer not to take the risk. So, simply because there are costs associated with litigation and legal enforcement it does not follow that A and B will judge it smart or appropriate to take the blockchain option. The context for the deal, the relationship between the parties, the nature of the transaction, and the overall calculation of utility and disutility remain critical to A and B’s decision whether to employ a smart contract. Generally speaking, where new technologies emerge—whether the technologies in question are relevant to either transactions or human interactions—we can expect lawyers to engage with these developments in either a coherentist or a regulatory-instrumentalist way. This gives rise to two distinct conversations, each with its own questions and concerns. We can start by sketching, first (in Sect. 3.1), the characteristics of coherentist thought and then (in Sect. 3.2) the characteristics of regulatory-instrumentalist thinking. After that, (in Sect. 3.3) we can see how a coherentist conversation about smart contracts might go and then (in Sect. 3.4) do the same in relation to a regulatory-instrumentalist conversation. This evolution in regulatory thinking is not surprising. Having recognised the limited fitness of traditional legal rules, and having taken a more regulatory approach, the next step is to think not just in terms of risk assessment and risk management but also to be mindful of the technological instruments that increasingly become available for use by regulators. In this way, the regulatory mind-set is focused not only on the risks to be managed but also how best to manage those risks (including making use of technological measures, whether soft or hard). Writing in the context of non-negotiable terms and conditions in online consumer contracts, Joshua Fairfield expresses just this kind of technocratic thought when he remarks that ‘if courts [or, we might say, the rules of contract law] will not protect consumers, robots will’.39 Imagine, for example, that regulators or consumers (just like legal practitioners) were able to rely on smart machines to scan on-line terms and conditions to see which, if any, were arguably unfair40; or imagine that a supplier’s standard terms and conditions had to be displayed in a format that would not permit anything other than clearly fair terms. While, in the former case, such an assistive technocratic intervention might support a transactionalist policy (improving the likelihood that consumers who agree to the proferred terms and conditions have done so on an informed basis), in the latter a harder technological measure might achieve a more acceptable balance of interests. However, as we have already suggested in Sect. 2, much of the puzzlement might be eased if we place the bare content of the smart contract in the context in which it has been formed. After all, the coded agreement on the blockchain does not come out of nowhere.42 Recalling our example in Sect. 2, the story starts with an off-chain off-line discussion between A and B in which they agree to pay a sum to C on the occasion of C’s marriage to D and in which they consider using a smart contract to execute the agreement. The agreement between A and B to pay the sum, and whatever they agree about using a smart contract to give effect to that agreement, will have all the ingredients that coherentists look for in a standard fiat contract—there is simply no special problem here about offer and acceptance and consideration. Nor is there a puzzle about the application of doctrines such as duress or undue influence. For example, if A has applied unfair pressure to B to commit to the deal, B might take court action in an attempt to avoid the transaction before it has been committed to the blockchain; if B tries to avoid the transaction when it is on the blockchain but not yet executed, it might not be possible to prevent the payment being made but, in principle, a court might order C to restore the value received. So, provided that the content of the smart contract is not abstracted from the off-chain context in which the transaction originated, there might be little to puzzle coherentists. What, though, if the smart contract is not properly executed? In Sect. 2, we considered a claim by C (against A and B) when the Oracle fails to advise that the marriage has taken place, so that no payment is made when it should have been. In such a scenario, if C seeks performance of the contract between A and B, this will turn on the background agreement (which is treated as a standard fiat contract) in conjunction with whatever the third-party beneficiary rules are in the applicable law. What, though, if it is the converse case, with the Oracle incorrectly advising that the marriage between C and D has taken place, so that the payment is made when it should not have been? In such a scenario, quite apart from any claim against the Oracle, there might be a restitutionary mechanism to reverse the payment without having to decide whether the smart contract is a contract as such43; or, it might be that the background agreement between A and B provides for a risk of this kind (allocating the risk to one of the parties and, possibly, providing also for insurance against the risk). Accordingly, there is no need for coherentists to lose much, if any, sleep over these puzzles. Furthermore, if there really is a problem in fitting the contract law template to the configuration of the blockchain then, as Lord Wilberforce once remarked, the courts—confronted by modern forms of transport, various kinds of automation, and novel business practices—have proved pretty adept at forcing ‘the facts to fit uneasily into the marked slots of offer, acceptance and consideration’44 or whatever other traditional categories of the law of contract might be applicable. These matters aside, coherentists might ask an interesting question about the relationship between the transactional effects that smart contracts might have and those that the courts, applying the law of contract, are willing to mandate. Where the effects generated by the former are identical to those mandated by the courts, there is no problem. However, in some cases, the effect of using smart contracts might be to produce transactional effects or outcomes that would not be mandated by the courts. Indeed, the example given in Sect. 2 of the article is precisely such a case because, while the use of a smart contract might lead to C being paid the sum agreed by A and B, this outcome would not be mandated by courts that are applying a restrictive third-party beneficiary rule (as was the case in English law before the 1999 Act). That said, if A and B simply gave a sum of money to C (in anticipation of C’s marriage to D), I take it that this would be permissible; and their intention if they commit their agreement to a smart contract is not different in any material way—it is not transformed into an intention to engage in some unlawful or impermissible activity. In other words, so long as the smart contract has a permissible purpose, the fact that it achieves something that the courts would not assist with is not a problem. Elsewhere, I have explored in some detail the relationship between prohibitions and permissions alongside the distinctions between encouraging a permitted act, discouraging the act, and neither encouraging nor discouraging that act.45 The key point is that, while it does follow from the fact that an act is prohibited that it should not be encouraged or assisted (hence, if the ‘public policy’ restrictions in contract law are in the nature of prohibitions, the offending transactions should not be enforced), it does not follow from the fact that an act is permissible that it should be encouraged or assisted. Hence, it does not follow that the courts should necessarily support or assist with the enforcement of a transaction simply because it is permitted. To be sure, unless the reason for the courts’ unwillingness to assist is obvious, we might expect some explanation. Essentially, though, this is no different from a parent who permits a teenage son or daughter to engage in some activity without also agreeing to support it (usually by declining to pay for it). Where the conversation is between top-down national regulators, there might well be various consultations, commissions and debates before a position is adopted. The regulation that eventuates might be in a hard law or a soft law form. There is no standard operating procedure for engaging with and making regulatory responses to emerging technologies. According to Aaron Wright and Primavera De Filippi, the implementation of blockchain-based governance, with ‘transparent decision-making procedures and […] decentralized incentives systems for collaboration and cooperation could make it easier for small and large communities to reach consensus and implement innovative forms of self-governance’.52 If this prospect were to encourage some business communities to adopt smart contracts, then there would surely be another regulatory-instrumentalist conversation but this time of a bottom-up self-regulating nature. Consider, for example, the idea that business contractors who are in international sales and carriage of goods by sea might use smart contracts, instead of letters of credit, as a way of securing the seller’s interest in being paid and the buyer’s interest in having the goods delivered. The idea is that the smart contract would provide that a specified value should be transferred from the buyer’s to the seller’s wallet when specified goods have reached a certain specified stage or point in their carriage and delivery. In principle, this might be an instruction to transfer the full payment for the goods or it might be coded for a series of stage payments (during the period from shipment to delivery). So, the question for our hypothetical business community is whether they see net utility in doing business using smart contracts or continuing to trade by using letters of credit. I will not attempt to second-guess the answer to this hypothetical question although I take it that the use of smart contracts would be facilitated if there were accepted customs and conventions that shaped and stabilised the expectations of parties who committed their agreement (or part thereof) to a blockchain. In this regard, we should clarify the relevance of coherentist concerns in a regulatory-instrumentalist conversation about the respective benefits and risks of using smart contracts or relying on letters of credit. For regulatory-instrumentalists such concerns are relevant only if the doctrinal puzzles and doubts might translate into practical risks. Now, if the biggest perceived practical risk is that, in a dispute between the parties, the courts might not treat the smart contract as if it were a fiat contract, that is perhaps not such a serious concern. As we have already said, where smart contracts are used in the shadow of background fiat contracts or agreements, it is to the latter that the law of contract will be applied. Furthermore, we should recall the classic coherentist puzzle that focuses on the relationship between the seller and the paying bank to which the seller presents the specified documents against which the bank (acting for the buyer) should pay the seller. The puzzle is that the seller seemingly gives no consideration for the bank’s services; the bank’s commission is covered by the buyer; and it follows that, in a sometimes quite long chain of contracts, there is no direct connecting link (no contract) between the seller and the bank. This being so, if the bank declined to pay against the seller’s presentation of conforming documents, one response to the seller’s claim for breach of contract by the bank would be that there is no contract between the parties and, thus, no contractual obligation owed by the bank to the seller. However, if the courts accepted this argument it would compromise the whole basis on which letters of credit are founded and it would be worse than commercially inconvenient. So, if the commercial courts were to be asked an analogous question about a blockchain arrangement, and assuming that smart contracts were embedded in the custom and practice of international trade, it is unlikely that they would want to compromise the basis on which business was done.53 Granted, we might not be altogether confident that a court would be so ready to accommodate the actualities of business practice during its embryonic development; but, in the longer run, if smart contracts are a part of business as usual, the commercial courts are unlikely to go against the grain of practice and the parties’ expectations. 4 The End of Contract? Yet, is this right? Is this the end of transactionalism? If transactions are technologically managed, does this represent the end of contracts? And is this the end of the line for the law of contracts? In an uncompromising form, transactionalism will treat a deal between A and B as the legitimate source of the parties’ rights and obligations inter se only if A and B each truly agreed to the deal. However, such a thoroughgoing commitment to subjectivism threatens to jeopardise both reliance on, and the utility of, contracts. Not surprisingly, then, in nineteenth-century America, against the background of an ‘increasingly national corporate economy, the goal of standardization of commercial transactions began to overwhelm the desire to conceive of contract law as expressing the subjective desires of individuals’.57 At the same time, in English law, in addition to the general shift to an objective approach, there was a particularly significant shift to a reasonable notice model in relation to the incorporation of the terms and conditions on which carriers (of both goods and persons) purported to contract. In the jurisprudence, this latter shift is symbolised by Mellish LJ’s direction to the jury in Parker v. South Eastern Railway Co,58 where the legal test was said to be not so much whether a customer actually was aware of the terms and had agreed to them but whether the company had given reasonable notice. In the twenty-first century, we need to ‘get real’ about transactionalism: ideal-typical transactionalism was left behind in the nineteenth century; and, the dealing and deals that take place in the consumer marketplace are heavily regulated transactions. So, if there is a concern that smart contracts are being abused in this marketplace—recall the stock example of technological force being applied to immobilise a vehicle when the consumer hirer or purchaser is late with a payment—then there is likely to be a focused regulatory response. That said, if the acceptability of smart contracts is seen to hinge on background anchoring agreements or the like, then some might argue for a return to a robust transactionalist standard for the validity of such agreements; but, even if this has some resonance in commercial dealing, in the consumer marketplace it seems likely that a non-transactional regulatory approach will continue to be dominant. As for concerns about the end of contract, we again need to get real. Contract qua transactionalism is not to be found in the consumer marketplace; and, in the business community, contract is at least as much about relational dealing (that is to say, contractual rights and obligations are taken to be based on the dealing (or dealings) between the parties, the context in which they have dealt, and the reasonable expectations that they have in that setting59) as it is about applying the literal terms of the deal and transactionalism. What will not survive in a world of automated transactions, where humans are taken out of the loop, is face to face dealing of the kind evoked by the traditional idea of contracts and haggling in a market place. Nevertheless, to repeat one of the points recurrently made in this article, the use of new transactional technologies, including blockchain and smart contracts, is likely to take place in the shadow of some agreement between off-chain human agents. In some cases, we might have to go quite a long way back to find the anchoring agreement or the signing up to the club rules, but these background agreements will be where we find the originating fiat contracts. In the case of business to consumer transacting, the automation of routine consumption is likely to be so pervasive that there will need to be a regulatory framework that determines an acceptable balance of stakeholders’ interests. Effectively, this is where we are today with traditional consumer contracting: there might be the form of a contract but there is little or nothing that is transactionalist about it. By contrast, businesses might continue to deal with one another in ways that reflect both transactionalist and relationalist understandings of a contractor’s rights and obligations. Here, the orginating agreements will testify to the persistence of contract, albeit in the background rather than the foreground where the technologies take care of performance. Secondly, there is the dimension that comprises the conditions for meaningful self-development and agency. Regulators should ensure that, in this dimension, there are appropriate supportive and restrictive conditions for agents to flourish. In particular, there needs to be a sense of self-esteem and respect; agents need to feel that their agency matters; and there needs to be sufficient trust and confidence in one’s fellow agents, together with sufficient predictability to plan, so as to operate in a way that is interactive and purposeful rather than merely defensive.64 With existence secured, and under the right conditions, human life becomes an opportunity for agents to be who they want to be, to have the projects that they want to have, to form the relationships that they want, to pursue the interests that they choose to have and so on. In the twenty-first century, no other view of human potential and aspiration is plausible; in the twenty-first century, it is axiomatic that humans are prospective agents and that agents need to be free. Thirdly, there is the dimension of moral aspiration. Here, regulators must secure and respect the conditions for a moral community, whether the particular community is guided by teleological or deontological standards, by rights or by duties, by communitarian or liberal or libertarian values, and so on. The generic context for moral community is impartial between competing moral visions, values, and ideals; but it must be conducive to ‘moral’ development and ‘moral’ agency in a formal sense. Agents who reason impartially will understand that each human agent is a stakeholder in the commons that protects the essential conditions for human existence together with the generic conditions of agency; and that these conditions must, therefore, be respected. Beyond these conditions, the moral aspiration is to do the right thing relative not simply to one’s own interests but relative to the interests that other human agents might have. While respect for the commons’ conditions is binding on all human agents, these conditions do not rule out the possibility of contestation and pluralism. The point is that the commons itself, although neutral between competing and conflicting views, sets the stage for human agents to articulate many different (and potentially conflicting) preferences, priorities and positions (both prudential and moral) that guide not only their personal lives but also their participation in regulatory arenas. Moral, political, legal and regulatory debates are all predicated on the existence of the commons. With regard to the first of our two additional questions, it might well be that blockchain and smart contracts, unlike many other new technologies, do not present any threat to the commons’ conditions. However, we should always satisfy ourselves that we are not using technologies in ways that might prove catastrophic in the most fundamental sense of compromising the commons. From the middle of the twentieth century, many nation states have expressed their fundamental (constitutional) values in terms of respect for human rights and human dignity.66 These values (most obviously the human right to life) clearly intersect with the commons’ conditions and there is much to debate about the nature of this relationship and the extent of any overlap. For example, if we understand the root idea of human dignity in terms of humans having the capacity freely to do the right thing for the right reason,67 then human dignity reaches directly to the commons’ conditions for moral agency68; and, similarly, if we understand privacy (whether derived from human rights or human dignity) as ring-fencing spaces for the self-development of agents, then it is more than a fundamental value recognised by a particular community, it reaches through to the commons’ conditions themselves. However, those nation states that articulate their particular identities by the way in which they interpret their commitment to respect for human dignity are far from homogeneous. Whereas, in some communities, the emphasis of human dignity is on individual empowerment and autonomy, in others it is on constraints relating to the sanctity, non-commercialisation, non-commodification, and non-instrumentalisation of human life.69 These differences in emphasis mean that communities articulate in very different ways on a range of beginning of life and end of life questions as well as questions of lifestyle, human enhancement, and the limits of markets, and so on. The thrust of this article is that there are many questions that lawyers might ask, and conversations that they might have, about smart contracts; that some questions are more challenging than others; that some questions are more urgent than others; and that there are some questions that we tend not to ask but which we should ask. If we are to ensure that the regulatory environment is fit for purpose (for Fintech in general and for smart contracts in particular), it is important to have the right people asking the right questions and having the right conversations in the right places. In this spirit, I have suggested, first, that the question that preoccupies coherentists (concerning the application of the law of contract to smart contracts) is neither as puzzling nor as important as it tends to be assumed. This is neither a key question nor a critical conversation. Secondly, where we have concerns about the acceptability of smart contracts, the conversation that we need to have is of a regulatory-instrumentalist nature. Generally, the tilt of English law is to give commercial people plenty of room to self-regulate (particularly through recognising standard forms and standard terms that are used in the trade). However, if there are public policy questions involving restrictions on the use of smart contracts (as might well be the case in relation to consumer transactions), then the appropriate balance of interests needs to be made by an institution that has both the necessary mandate and the appropriate mind-set. For some of the already large literature on the legal concerns arising from blockchain, see Zetzsche et al. (2017a), pp 5–9. Casey and Vigna (2018), pp 53–61. ‘Transactionalism’ holds that the justification for treating parties as bound by their contractual obligations is that they have voluntarily agreed to (committed to) the deal. Casey and Vigna (2018), pp 1–15. A case in point is that of business networks: see Brownsword (2012a). As with ‘prosumers’ in the rapidly developing share economy: see, e.g., Butenko and Cseres (2015). (1861) 25 JP 517, 1 B & S 393, 30 LJQB 265. For commentary, see Adams et al. (1997). To the extent that the reform of the privity rule required a legislative intervention, this suggests a regulatory-instrumentalist approach. However, to the extent that the reform was based on classical contractual principles (giving effect to the intentions of the contracting parties), rather than addressing the commercial inconvenience of the rule, this was more like a coherentist exercise. For example, see Werbach and Cornell (2017), pp 338 et seq. ; and Farrell, Machin and Hinchliffe (2017), pp 96 et seq. See, e.g., Adams and Brownsword (2007). Compare, for example, the ‘tutorial’ on creating a smart contract at https://medium.com/@ConsenSys/a-101-noob-intro-to-programming-smart-contracts-on-ethereum-695d15c1dab4 (accessed 1 July 2018). De Filippi and Wright (2018), p 74. For example, even if there is a ‘deal’, it will not be treated as a fiat contract unless it is supported by an intention to create legal relations: see Balfour v. Balfour  2 KB 571. For some helpful reflections along such lines, see Scholz (2017). See, e.g., De Filippi and Wright (2018), p 77. See, e.g., De Filippi and Wright (2018), pp 83–84. To be sure, in principle, a smart contract might be coded or ‘architected’ in just the way that the buyer needs; but the practical question is whether the seller will agree to such an arrangement. For further issues relating to insolvency, see Farrell et al. (2017). Compare Butenko and Cseres (2015) and Lammers and Diestelmeier (2017). See, e.g., De Filippi and Wright (2018), p 76 (concerning Ujo Music’s website for the sale of digital music files). We should also anticipate that the law of contract might be relevant to the characterisation, not of smart contracts, but rather of the network of nodes that support the distributed ledger system: for discussion, see Zetzsche et al. (2017a). For a somewhat similar view, presented as a ‘legalistic approach’ to emerging technologies, see Petit (2018). Compare Bayern et al. (2017), where company structures that are provided for in US, German, Swiss, and UK law are reviewed to see whether they might plausibly act as a host for autonomous systems that provide a service (such as file storage, file retrieval and metadata management). For discussion, see Brownsword (2017a). For example, the UK Financial Conduct Authority is conspicuously sensitised to ‘reg tech’ (in the sense of utilising information technologies to enhance regulatory processes with a particular emphasis on monitoring, reporting and compliance): see FCA Press Release 20/02/2018, available at https://www.fca.org.uk/news/press-releases/fca-launches-call-input-use-technology-achieve-smarter-regulatory-reporting (accessed 26 May 2018). For example, in the United States, the interests of the farming community were subordinated to the greater good promised by the development of the railroad network: see Horwitz (1977). Compare, too, Pagallo (2013), p 190, writing about the technological intermediation of transactions: ‘[The proposal for] the personal liability of robots demonstrates a fruitful way of striking a balance between the different human interests involved, namely, between the interest of the counterparties of robots to safely transact or interact with them, and the claim of users and owners of robots not to be ruined by the growing autonomy and even unpredictability of their behaviour.’. Seminally, see Lessig (1999). See, too, Brownsword (2005). See, e.g., O’Malley (2013), p 280. See, e.g., Brownsword (2012b, 2017b). Compare Micklitz et al. (2017). For example, see the discussion in Werbach and Cornell (2017), pp 338 et seq. Compare De Filippi and Wright (2018), pp 74 et seq. At p 78, we read: ‘Even where smart contracts entirely replace formal legal agreements, these programs do not operate in a vacuum’. In English law, the decision of the UK Supreme Court in Patel v. Mirza  UKSC 42 has significantly raised the profile of a possible restitutionary response to claims arising in connection with illegal contracts. See, New Zealand Shipping Co Ltd v. A.M. Satterthwaite and Co Ltd: The Eurymedon  AC 154, 167. For a somewhat similar view, see Petit (2018). Compare the excellent discussion of the regulation of ‘TechFins’ in Zetzsche et al. (2017b), pp 31 et seq. Law Commission (2017), p 20. As to the former, a legislative amendment (HB 2417) to the Arizona Electronic Transactions Act provides that a contract relating to a transaction may not be denied legal effect, validity or enforceability solely because that contract contains ‘a smart contract term’: see, e.g., https://newmedialaw.proskauer.com/2017/04/20/arizona-passes-groundbreaking-blockchain-and-smart-contract-law-state-blockchain-laws-on-the-rise/ (last accessed 7 July 2018); and, as to the latter, see, e.g., the initiative in Vermont: https://law.justia.com/codes/vermont/2016/title-12/chapter-81/section-1913 (last accessed 24 March 2018). Wright and De Filippi (2015), p 38. See, too, De Filippi and Wright (2018). For a particularly influential articulation of this view, see Steyn (1997). Zuboff (2015), pp 85–86 (emphasis added). Horwitz (1992), p 37. At pp 48–49, Horwitz notes a parallel transformation in relation to both corporate forms and agency. (1877) 2 C.P.D. 416; and, see, Waddams (2011), p 39. Seminally, see Macaulay (1963, 2003). These questions are dealt with at length in Brownsword (2018b). Compare Rockstrom (2009), and Raworth (2017), pp 43–55. Compare the insightful analysis of the importance of such conditions in Brincker (2017). See Greenfield (2017), esp. ch. 10; and, recall the example of the local market in renewable energy given in Sect. 2.2. For such a view, see Brownsword (2013). See Beyleveld and Brownsword (2001), Caulfield and Brownsword (2006) and Brownsword (2008). 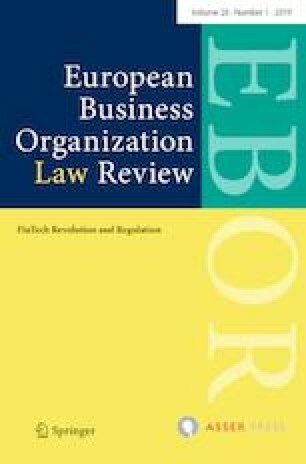 Compare De Filippi and Wright (2018), at p 210: ‘If blockchain technology matures, we may need to ask ourselves whether we would rather live in a world where most of our economic transactions and social interactions are constrained by rules of law—which are universal but also more flexible and ambiguous, and therefore not perfectly enforceable—or whether we would rather surrender ourselves to the rules of code’. See, the excellent discussion in Levy (2017). Compare Kroll et al. (2017), pp 702–704. Bayern et al. (2017), p 156. See, e.g., Koops et al. (2010), and Bryson et al. (2017). See, e.g., Casey and Vigna (2018) (e.g. pp 9–10 for a non-exhaustive, but substantial, list of potential applications). Compare Wallach (2015), p 10: ‘Bowing to political and economic imperatives is not sufficient. Nor is it acceptable to defer to the mechanistic unfolding of technological possibilities. In a democratic society, we—the public—should give approval to the futures being created. At this critical juncture in history, an informed conversation must take place before we can properly give our assent or dissent.’. Again, see the insightful analysis in Greenfield (2017).